Hermitage Capital CEO Bill Browder is sworn in before a continuation of Senate Judiciary Committee hearing on alleged Russian meddling in the 2016 presidential election on Capitol Hill in Washington, July 27, 2017. Financier Bill Browder testified Thursday before the U.S. Senate Judiciary Committee that Russian President Vladimir Putin was the "richest man in the world," a result of "terrible crimes" Putin's government committed without the threat of retribution. "I believe he is worth $200 billion," Browder said, testifying in the Senate panel's probe of Russian meddling in the 2016 presidential election. "The purpose of the Putin regime has been to commit terrible crimes in order to get that money, and he doesn't want to lose that money by having it frozen. 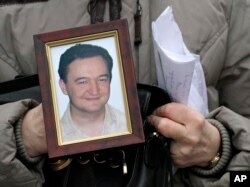 So he is personally at risk of the Magnitsky Act." Browder said that to protect the vast amounts of money, some of which he said was in American banks, Putin launched a campaign to repeal the Magnitsky Act, a U.S. law that imposed sanctions on Russian officials whom the U.S. held responsible for the 2009 death of Russian lawyer Sergei Magnitsky, who died in a Russian jail after being retained by Browder to investigate corruption. Browder is the CEO of Hermitage Capital Management, an investment firm that was once the largest portfolio investor in Russia. Browder testified that Kremlin-linked Natalia Veselnitskaya was the "family lawyer" for the Russian family that owns Prevezon Holdings Ltd., the target of a $230 million fraud and money-laundering case that Magnitsky had exposed. Veselnitskaya once represented a military unit run by the Federal Security Service of the Russian Federation (FSB), the country's primary intelligence agency. She also met last June with Donald Trump Jr., presidential senior adviser and son-in-law Jared Kushner and former Trump campaign manager Paul Manafort, promising incriminating information about 2016 Democratic presidential nominee Hillary Clinton. Although Trump Jr.'s publicly released emails show Clinton was to be the the primary topic of discussion at the Trump Tower meeting, Trump Jr. has maintained the topic was instead the adoption of Russian children. Browder testified that when Congress passed the Magnitsky Act, Putin retaliated by imposing a ban on Russian orphans. The goal of the meeting, Browder said, "was to repeal the Magnitsky Act" and the sanctions that were associated with its imposition. Under questioning by Democratic Senator Sheldon Whitehouse of Rhode Island, Browder affirmed that talk of adoption was effectively Russian code for lifting the sanctions. "Nobody was talking about adoption," Browder said. "They were talking about the repeal of sanctions, so that Russian torturers and murderers could freely travel and keep their money in America." When Sheldon asked whether Trump Jr., Kushner and Manafort would have known about the code language, Browder responded, "I don't want to put thoughts into anybody's head, but I can say with certainty that nobody was talking about adoption." Republican Senator Lindsey Graham of South Carolina said the Putin government was not committed to any particular U.S. political party. He told Fox News that the Washington-based intelligence company Fusion GPS, which commissioned a dossier of salacious allegations against Donald Trump, has also been supported by Russia. Graham reiterated the Russians hacked into Democratic National Committee emails and that Veselnitskaya was "actually working for the Russians." "So they're trying to play both sides against the middle, and I hope the country wakes up to the threat Russia presents to us all," Graham said. The Justice Department settled the $230 million case against Prevezon, which was represented by Velnitskaya, for $6 million in May, two days before the case was scheduled to go to trial. The settlement prompted 17 Democrats on the House Judiciary Committee to send a letter to the Justice Department on July 12, demanding an explanation for why the agency had settled the case. "Two days before this trial was set to begin, the department agreed to settle this $230 million case for less than $6 million and no admission of wrongdoing," the letter said. FILE - Senate Majority Whip John Cornyn of Texas talks with reporters on Capitol Hill in Washington, Jan. 3, 2017. 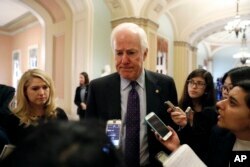 Republican Senator John Cornyn of Texas asked Browder whether "commercial entities that are really fronts for state-owned enterprises and people like Vladimir Putin" should be required to register under the U.S. Foreign Agents Registration Act, which requires agents of foreign countries to disclose their financial and political activities. Browder responded, "It's absolutely essential that they do, and it's absolutely essential that there's transparency about who people are talking to and about what their interests are." He added, "We have a free society, free press, democracy, open ideas, amendments, et cetera, and they're taking advantage of that." U.S. intelligence agencies have concluded that Russia meddled in last year's U.S. presidential election with the intent of helping Trump win, resulting in several congressional investigations and a Justice Department probe led by special counsel Robert Mueller. Putin complained Thursday that the probes were a reflection of an escalation of anti-Russian sentiment. "We are just seeing a rise in anti-Russia hysteria," Putin said at a news conference in Finland. "It's a great pity that Russian-U.S relations are being sacrificed to resolve questions of domestic politics."